Our committee meetings are usually held on the third Tuesday of the month at 6.30pm. During daylight saving time these meetings are generally held in the Tennis Club building at Wickhams Reserve in Launching Place. Over the Autumn and Winter months the meetings are held at the Hillcrest CFA building in Woori Yallock. 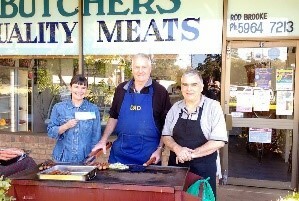 WHYLD Community Group run the Woori Butcher BBQ on the 5th Saturday of the month from 9am until 1pm. This BBQ is generously hosted and provided for (sausages, BBQ, gas & table) by our local butcher, Rod Brooke. Please support your local businesses and shop locally. We produce an annual newsletter in January each year with distribution in February. The next Butcher’s BBQ will be on Saturday the 13th of April 2019. Our next Meeting will be at the Hillcrest Fire Station at 7:00 pm on Tuesday the 30th of April 2019. Everyone is welcome. We would love to have some new members join us.